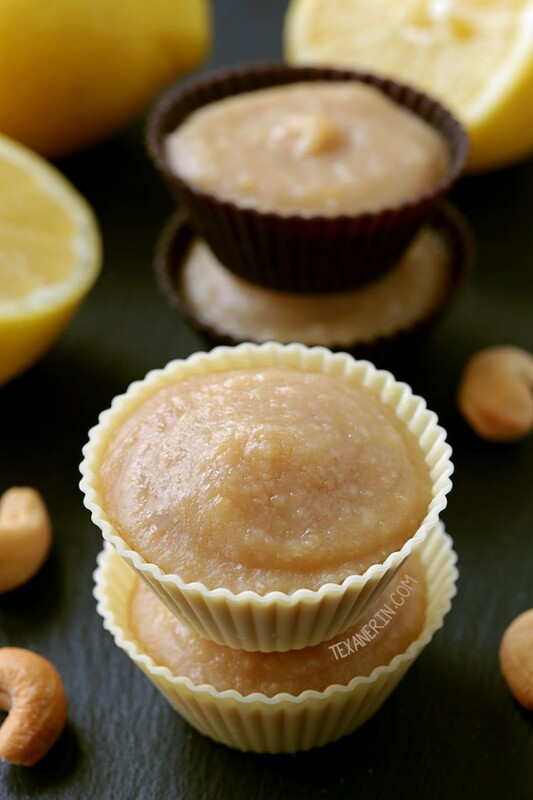 This healthy paleo lemon fudge is incredibly easy to make and is also vegan. This is another one of those recipes where I have to pick a title and it doesn’t exactly fit, but whatever… it’s the closest I could get. ;) This vegan paleo lemon fudge isn’t as fudgy as regular fudge, but it’s fudge-like and should definitely satisfy any cravings you may have. This is probably the healthiest fudge recipe I’ll ever post. It consists of cashew butter, coconut butter, coconut oil, lemon juice + zest, and a whopping 1 tablespoon of maple syrup for about 10 pieces. I love the lemon flavor in here. I thought that the cashew butter would overpower the lemon but it doesn’t at all. At least with my cashew butter! (I used homemade). You can taste some coconut but it’s not all that strong and I’ve tried with refined and unrefined coconut oil. If you want as little coconut flavor as possible, use refined. 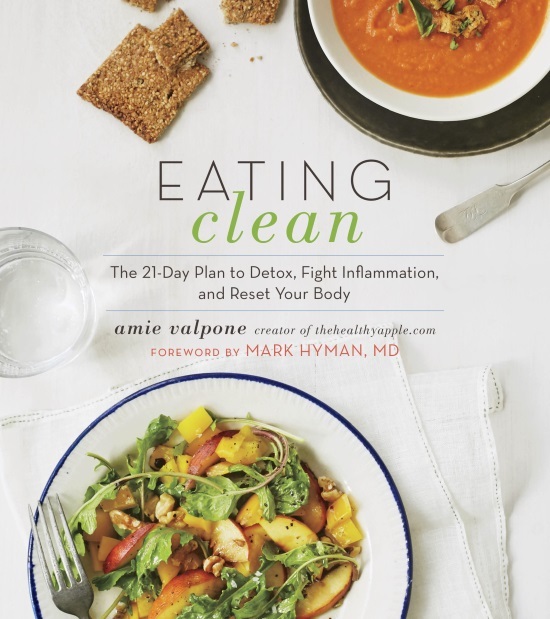 I also want to tell you about a new book that just came out called Eating Clean: The 21-Day Plan to Detox, Fight Inflammation, and Reset Your Body by Amie Valpone of The Healthy Apple. I have a whole bunch of health issues that I don’t talk about here. It’s nothing serious (as far as I know) but basically half of me hurts most of the time and has for years. It hurts to stand, walk, lie down and even to sit sometimes. And I’ve had a light non-stop headache for every second of the past 5 years. Doctors have been no help at all. Then I started working on the cookbook and after a few months of that mega-stress and eating pretty much only sweets all day, it seems as though I damaged my gut. I went from having no food intolerances to reacting to everything I ate except for fruit, veggies and meat. 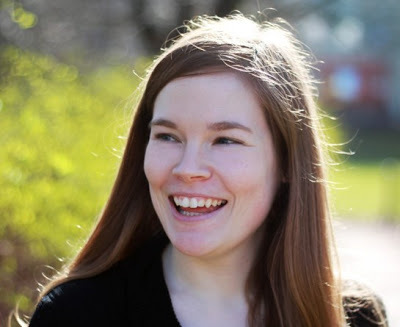 I also started having gastrointestinal issues – something I had never had before. It was only then that I realized that food plays a much bigger role in my health than I had thought. I look back at myself and have no idea what I was thinking in regards to what I was eating. Diet is such an integral part of healing and Eating Clean will certainly help you reclaim your health! I know it’s certainly helped me get back on the right path. Amie’s book is all about how to reset your body and fight inflammation. It includes a 2-week meal plan, 200 recipes (which are all gluten-free, dairy-free and vegetarian) and a 21-day elimination diet. You can read more about it here! Stir all the ingredients together and pour into mini muffin liners (waxed, paper, or silicone liners all work) or a silicone candy mold. It yields just over 2/3 cup of fudge so if you use 1 tablespoon of fudge per liner, that'd yield 10 pieces. Freeze for 30 minutes or refrigerate until hardened. Refrigerate in an airtight container for up to 4 days or freeze for up to 2 weeks. They're too hard to eat straight from the freezer so you need to let them defrost for about 20 minutes. I think freezing and then defrosting them right before eating yields a fudgier outcome. The fudginess also depends on your cashew and coconut butter. I've made this about 6 times, using homemade cashew butter and coconut butter each time (all from different batches). Each batch of homemade butter yielded a slightly different texture in the final product. It should be soft enough to stir. If it's not, I recommend weighing 30 grams into a small saucepan and melting it gently. 30 grams of unmelted coconut butter is actually a little more than 2 tablespoons. I had my fudge sitting out for half the day and while it didn't melt, I wouldn't want to transport them at room temperature. Transport them after having frozen them! It's still quite cold here but they may melt in warmer environments. 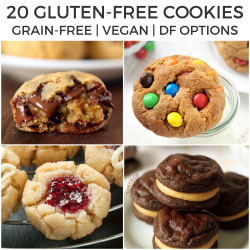 If you want to make a bigger batch, I think this would work well using the small jar of a high-powered blender. 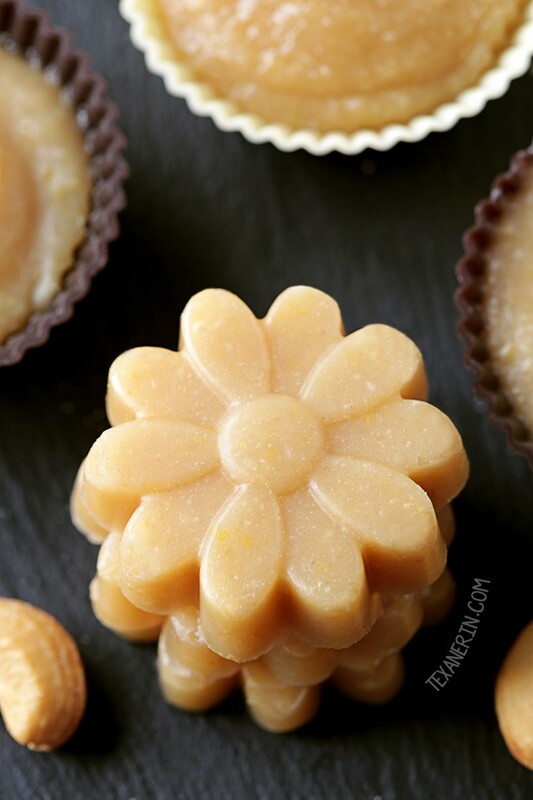 44 comments on “Paleo Lemon Fudge (vegan, gluten-free, grain-free, dairy-free)” — Add one! Could you use sugar free maple syrup to make it low carb? I haven’t tried it but I believe that’d work! Hi Erin from the Mexico/Guatemala border. Going gluten free involved some serious grieving for my delish muffins which I’d perfected — like the coconut/mango/cardamon/orange ones. R.I.P. That is why I am so very grateful to you for helping us find amazing deserts we can enjoy. My little girl and I did eat a bit of this right from the spoon, gasp, because it is delightful. I saw these over on your facebook and I feel in love with them. I had never thought about making a fudge that wasn’t packed with sugar! The little mold you used for these is adorable too! Love it so much. I also love that you used homemade cashew butter! I’ve made my own peanut butter but haven’t tried cashew butter at home yet. To be honest I’m not sure if I’ve ever even had cashew butter! Eating Clean: The 21-Day Plan to Detox sounds like a fantastic book! I need to look that up! I’m really excited to check out Amie’s book. I’ve become more intrigued with the role food plays with overall health as I’ve gotten older. Also, this fudge sounds so intriguing! Those little flowers of fudge are just too cute! Who knew that a healthy fudge even existed? Nice to read that eating clean doesn’t mean total deprivation. Love this!! And I totally need a copy of that book… asap. Cashew butter, coconut and lemon – soooo many things to love in this yummy looking fudge! I actually like the fact that this has no condensed milk in it! I do like that kind of fudge but SO much sugar. Bla! Mmm this sounds like a great book – I could really use a reset!! Love this fudge and the fact that it’s healthy! I hope he’ll enjoy it! As a food blogger, it is challenging to eat right all of the time. Especially when we are posting sweets and holiday dishes, etc. I like the idea of giving my body a two week adjustment! The fudge looks amazing…love the lemon idea and the fact that it’s good for us is a huge bonus! What a gorgeous piece of fudge! I really love this recipe! It’s crazy what a big difference it can make! This really is the healthiest fudge I have ever seen! I have a feeling I would have a hard time not eating the whole batch. Thank you so much Erin; you are amazing and I am so grateful for you sharing this! You made my day. I hope you are loving my book. I’m sending you so much love and the biggest hug. xoox Thank you again! Hi there! I’m so happy that you stuck around and found some more recipes you like. :) And oooh! I’ll trade you some of your coconut lemon macaroons for some of this fudge. Those sound great! I hope you’ll enjoy the fudge and thanks a bunch for your comment. I’m not huge on lemon but I did make some gluten and dairy free lemon cupcakes this weekend for my oldest son’s birthday party and they were more like angel food cupcakes with lemon flavor and they were SO good! So he might like this too…or hey, even I might. I am starting to like lemon. Anyhow, the cookbook looks like a good one. My middle son was diagnosed with Crohns 2 years ago this month and I have learned (what the medical community does NOT want you to know) is that most of your health problems can be controlled and reversed just by the way you eat. I have been working with a lady who introduced me to the macrobiotic way of living which isn’t totally about what you eat but how you prepare. But it for the most part is vegan eating. And I have been moving that direction for about a year now as far as how I eat and I feel much better and so does my family. Clean eating is the way to go I feel. My son does not take medication for his Crohns. We control it by how he eats and some supplements that he takes daily. I hope you are feeling better now!